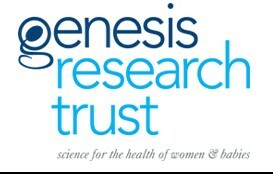 The Genesis Research Trust supports high quality research into reproductive diseases which primarily affect women. The trust is renowned for its support of work into premature birth, foetal damage and genetic defects, miscarriage and stillbirth, stem cell biology as well as pioneering research in IVF and embryo screening. It is also responsible for various postgraduate teaching activities, namely symposia on related subjects of interest. The latest initiative is to establish a new professorial chair of reproductive medicine at Imperial College. Applications for a Chief Executive are invited to manage and expand a small but dedicated team of (currently 12 people), based at the Institute of Reproductive & Developmental Biology, Hammersmith Hospital, Imperial College Campus. The Trust wishes to raise its national and international profile, and to increase funding for the projects and doctoral studentships it has in hand. The successful candidate will have demonstrable leadership skills, a proven track record in charitable fundraising, and excellent interpersonal skills in dealing with our large donor base, staff and stakeholders. Whilst a scientific background is not essential, the successful applicant should have strong sympathy with those who suffer from reproductive and allied problems, and some understanding of academic institutions. A competitive salary is offered. Applicants are requested to supply an up-to-date CV as well as a letter of motivation, explaining interest in and suitability for the role.